So the past two weeks seem like a blur to your humble No Fenders scribe, as I’ve definitely seen a little more of the unusual then planned for... As it all started by South Sound Bureau Chief Mary Ellen inviting Mwah down to Tacoma for the weekend of the Long Beach & Chinese GP’s, to which I thought, what the H-E Double Hockey sticks, eh? Might as whale get outta Dodge ‘N try breathin’ some fresh air after having stared at le Confuzer way too many hours previously. Not to mention the soothing company of the revered 92 years young ‘Aunty Harriet - who’s got nothin’ wrong with her hearing; WHAT? Asking me if there are any races on this weekend? Yes, the Chinese Grand Prix is on at midnight. Who? The Chinese Grand Prix... Portuguese Stampede??? Yep! That’s right there was a stampede in Portugal; Porch You Gall, I was corrected upon my pronunciation... Oh? How many were trampled in the Stampede? Oh, I don’t know - as I just heard the headline before I came down; Hya! And besides, NO sweat, I’ll tape the IndyCar race since I won’t get home in time for the Monday replay - and then can just watch the Formula 1 race rebroadcast Tuesday morning... Since comca$t GOOBERED my ‘Ol School technology by forcing me onto a ‘DIG I-T! TULL box that won’t allow my VCR to record more then one channel at a time; Oh Never Mind! Catching the bus home Monday morning after a two-plus hours ride and stepping off around 12:15PM, my stomach was grumblin’ so I made a beeline for the same said Sandwich Pub I’d met the crazy old lady in previously. And as I turned the corner to walk down my hill I saw several vehicles parked along the kerb - which usually only sees vehicles parked there during snow storms when the hill is iced over; WTF? Mitch took me into the general office and introduces me to a female Red Cross volunteer who told me: the GOOD news is your unit was undamaged by the fire! It may smell like smoke a little while, but it’ll dissipate... Unfortunately you CANNOT enter your unit for approx 2-3hrs until the fire alarms are hooked up and power is restored. Then she passed me off to her male counterpart - who was the head Red Cross volunteer who asked me: you do have insurance, RIGHT? Saying they’d pay for me to stay somewhere for the night if I needed to do so... Ok, but I really need to eat something first. After a piece ‘O my Bitamyte sandwich; NOT! Hmm? I’d better call Mary Ellen and see if I can return for another night instead of sitting round here for three hours and then surprise! Yet I had several thoughts upon my near miss with the devastation of the fire to my Apartment building; a two-alarm fire for which the local newspaper said a man was rescued from his third floor balcony after being trapped by flames and a large dog was also rescued - the blaze having been set by carelessness with incense that ignited combustibles... As half of the building’s occupants - twelve units have been displaced due to fire, smoke and water damage! As one protester was killed leading up to the Bahrain Grand Prix. Two Force India team members departed the Kingdom after their unmarked vehicle became embroiled in a protest skirmish - involving Molotov cocktails; not to mention the entire team forsaking Friday’s Free Practice-2 session in order to leave the circuit under the safety of daylight... Which doesn’t even address the further death toll occurring after the “United-for-All” Grand Prix - yeah, right you BASTARDOS! Hmm? Did Uncle Bernaughty drop by the Bahrain International Circuit during race weekend? Thursday morning I caught the Shuttle Express to the airport - as the driver said I know you, you’re the guy I gave a ride home to once before who spotted Air Force One, right? Well actually that was another blind gentlemen as I always chuckle to myself over how blind people are immediately classified as being completely blind... As the driver and van riders had been quite surprised when this man who was only blind in one eye called out from the front passenger seat whilst upon the I-5 Freeway; there’s Air Force One. And I felt like I was getting my Bobby Allison indoctrination “Justin-time” for my big Arizona adventure. As the third passenger we picked up - who was off to Chicago said her hair was still wet and did anyone mind turning up the heat? 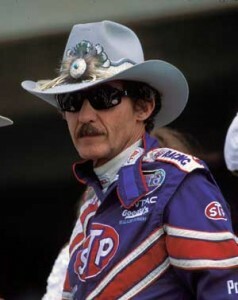 So there I sat in my gortex raincoat, windows up and the heat suddenly blasting us to tarnations... Kinda like when ‘Ol Bobby drove around home in the Alabama summers the exact same way to train for driving in his “RASSCAR Bomber; CRIKEYS! And of course The Valley of the Sun was having an unexpected HEAT wave - which made me just marvel that much more as my brother Miguel pointed out the black Ferrari convertible cruising alongside us with its top down as it was only 97deg-f ambient outside; Aye Karumba! And I guessed it was a F430 - which had the most soothing tome of the weekend, as Miguel informed me there was zero identifying badge-work upon it, albeit it had a clear glass rear bonnet cover which showed off the Scuderia’s upper engine brightwork, i.e. ; valve covers, intake manifolds, etc. Welcome to Arizona baby! The reason for this trip into a blasting hot oven - as it would be 102-103 degrees the rest of my duration was to go to Phoenix International Raceway for the first time in 14-years to go for a three lap excursion in a real honest-to-goodness, bonafied NASCAR Stock Car; CRIKEYS!